Unlimited Tattoos, over 500 to choose from. 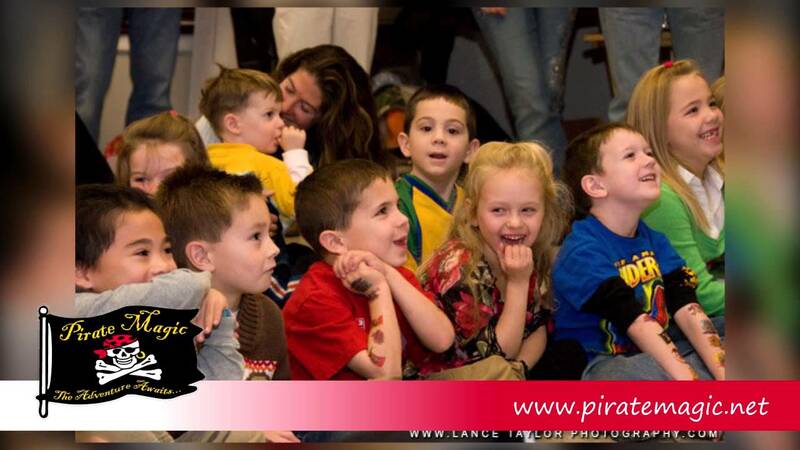 Pirate magic is 5 different types of entertainment in one complete and awesome, low-cost package! You will get a DJ dance party, Fully Interactive Magic Show (all children do the magic), Theatrical Story Teller, Unlimited Temporary Tattoos, and an Opera Singer. 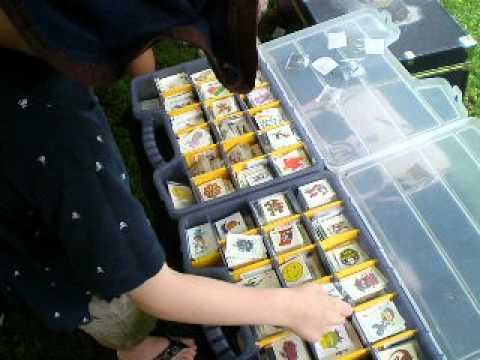 Also included are a Treasure Hunt, all the Goodie Bags ( 4 styles to choose from), and Freeze Dance. Children of all ages and gender will love my show, or it's 100 percent Free! 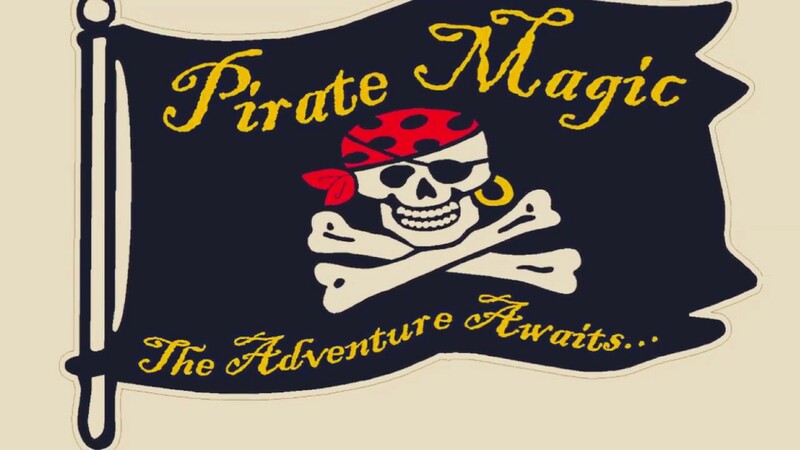 Check me out on Yelp or Google, just search for "Pirate Magic". I promise, no one is better. I can also adapt to any theme from Unicorns, to Pokemon as well as Princess and mermaids. Bringing children super Happiness and endless smiles since 1992! Captain Silly Bones was the best choice for our party. From the moment he walked in the door he kept the kids engaged. He was great at pulling all the kids together to make sure they all participated in the fun. Even the adults said how engaging his show was! He had temp tattoos, music, good bags and much more! Our experience was wonderful and I highly recommend hiring Captain Silly Bones if you're looking for a one stop shop party package. Thanks so much for taking the time to write a review, that was so nice of you. Thanks so much for your business and bless your beautiful family. Maximus is a cool name and a cool kid. Since he is too little for any thank you gifts, his big sister, Clarissa, will get them. Once again, thank you so much for your business. I was truly blessed to have such warm and generous clients. Everything went as planned and more. So tired of the bounce,-house parties and pizza. Captain Silly Bones kept children and adults entertained. Only problem is my son keeps wanting me to check his ears for quarters, and it wasn't even his birthday. A great time was had by all!! Thanks Captain Silly Bones!!!! Captain Silly was great, he gave an awesome show and was able to keep everyone entertained from little kids to teenagers even the adults. He had music, he even did the piñatas with us. All the kids were super happy. It was awesome. I definitely recommend you book him for your events. Thanks so much for taking the time to review my services. Your family is truly awesome and thanks for making me feel at home. I appreciate your business, hospitality and also the delicious food you fed me. Thanks again for everything. Sincerely yours Captain Silly! The kids were very entertained! Such a nice guy. Thank you so much for taking the time to write a review. I really appreciate it. Have a great rest of the summer. 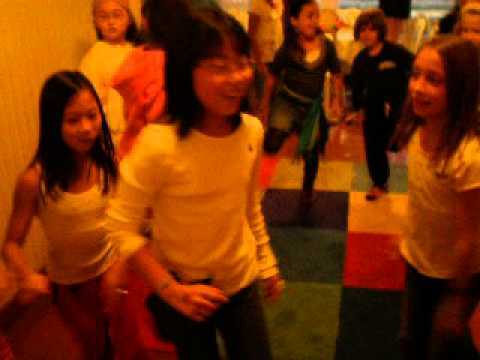 Party for my 8 year old daughter. He was loved by all. Dave, thanks so much for the review, it is very nice of you. You have an amazing family. Also thanks for the delicious food, your chefs are truly talented. Hotel Tabard Inn has some of the tastiest food I ever had at any party and really appreciated you feeding me..
Marc taken care around 25 kids with full energy and entertaining all the kids irrespective of age group 5-12 yrs boys and girls, All Kids said they had fun with this program. 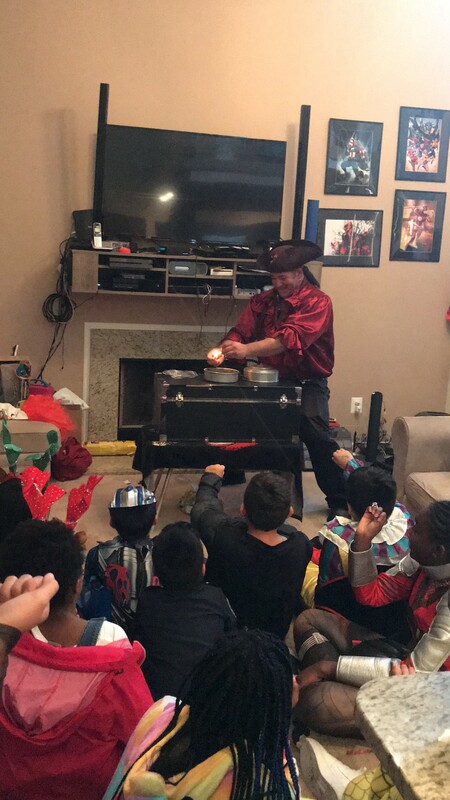 Kids of all ages were captivated by Captian Silly Bones!! We hired Captain Silly Bones for a joint party for our 1 and 4 year old girls in May 2014 which was held in a large restaurant in Tysons Corner. There were about 30+ kids ranging in ages from 1 to 10 years old and he had them all entranced! I couldn't believe it. Even my 4 year old who is so into princesses I thought she wouldn't be into it but she was giggling and shouting with excitement with everything he did. Boys and girls, young and older kids loved him. Everytime I looked over they were all captivated by him. All the parents couldn't believe it either and were so glad to be able to eat and enjoy the party in peace while Captain Silly Bones took care of our kids. He absolutely made our party!! In fact, one of my friends hired him months later for her son's party because she was so impressed. And one final note, I found him to be the most affordable, best value for money entertainer for a large party. Insurance: $1,000,000 - Any PTA, YMCA or Corporate, Private companies...Includes Summer Camps, Day Cares! I am the only magician that can guarantee that both boys and girls, no matter the age, will have the greatest time of their lives or you won't pay! That is right, Happiness Guaranteed! I can also promise you that the children will be with me the whole show, so you will be free to party with your grown up friends. I can also adapt my show to include every theme your child would want, from Mine Craft to Pokemon and My Little Pony to Monster High! My name is Marc Schack and I am 37 years old. I have been entertaining and making children happy for 23 years and counting. I started performing in 1992 at a place called "Once Upon A Birthday" (Johnny Depp aka Jack Sparrow was still in 21 Jump Street at the time). At Once Upon a Birthday I would dress up as a pirate and perform magic and tell stories to children of all ages. After three years the company moved away and I stayed, thus Pirate Magic was born! During the school year, I teach children with special needs life skills. I have been working with special needs children for 16 years. With my 16 years experience, I can easily entertain children with disabilities and accommodate parties with special requests. I also worked in a daycare with school age children (K-5) from 1992-2006. The greatest thing about my show, other than super happy children, is that I will teach the children important life lessons including Fire Safety (Depends on age of children), who to call in case of an emergency, ladies first as well as the importance of saying please and thank you. All these lessons are incorporated during the course of my show in a super fun and non lecturing way. For 20 plus years I have been entertaining and educating children. I use those Twenty Years of knowledge and apply it to my routine, thus your children and guests are guaranteed to have an awesome time! I love what I do and it will show!!! Most important I value you and your family! I will treat you with the upmost courtesy and respect!! No child will ever be asked to leave my show! If you are looking for top quality entertainment for kids of all ages, than I am the entertainer for you.I promise that your children will be happy and entertained or you don't pay! 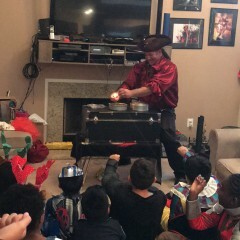 I am the only magician that includes all the children in the magic show, that's right, I guarantee that 3 to 15 year old's participate and watch my show the whole time. My secret to a successful party is positive reinforcement (cool giveaways after every magic trick) mixed with super hi energy! Also every kid present does the magic, instead of just watch like other shows! December 22, 2017–January 08, 2018 • 12:00pm - 12:00am away on vacation, limited computer Access. 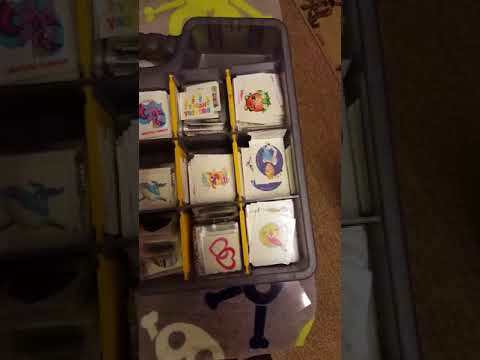 Starts with unlimited temporary tattoos (the filler activity, allows all guests to arrive before the show begins), This is followed by a comedy routine, Magic Show, Limbo and a Treasure Hunt (which supplies the children with gender specific goodie bags, Pirate or Princess) Also there is awesome music throughout the party, thus the DJ part of my show! Marc Schack aka Captain Silly Bones! Sole Owner and party Host! Started performing for children when I was 16 years old, back in 1992! I worked for "Once Upon a Birthday" and was trained in the art of Story Telling and Magic!